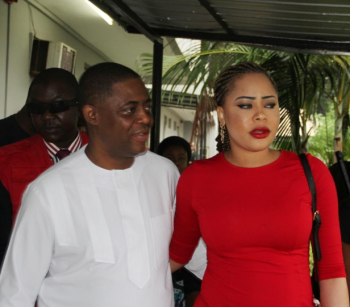 Fani-Kayode former Special Assistant (Public Affairs) to President Olusegun Obasanjo Following the arrest of his wife, Mrs Precious Fani- Kayode, by the Economic and Finacial Crime Commission on Monday in Ado-Ekit former Minister of Aviation, Femi Fani-Kayode has said that the government of President Buhari is sick and cowardly. He made this known in a statement read thus This govt is sick and cowardly and so are the EFCC. If you have a problem with me face me and leave my family alone. My wife travelled to Ado Ekiti to see my friend and brother Governor Fayose and his family. Fani-Kayode They were on their way out of town when they went to Access Bank in Ado Ekiti to get some money. When they got there my 8 month old son Aragorn and wife Precious Chikwendu were illegally detained, brutalised and put under arrest on the orders of the EFCC at a bank in Ado Ekiti today. She has never had any business with me, she has never been formally invited by the EFCC or asked any questions about her transactions and neither have they written to her on any issue even though they are always sending letters to my house and sending people there. If Buhari wants to deal with me why doesnt he face me like a man obstead of trying to harm and hurt my 8 month old son and wife. Had it not been for the intervention of Governor Ayo Fayose they would have been taken them away and subjected them to all manner of harm and indignities simply because she is married to me. This was an account that has 200,000 naira in it and that has never had more than 500,000. She has operated it since 2005 and she stopped using it in 2013. The account has no connection with me and I did not know it existed till today. In an attempt to starve and harass me and my family all my accounts and wifes accounts have been frozen. Now they are resorting to arresting peoples wives and children for no just cause. I thank God for Gov. Fayose and the people of Ado Ekiti who stormed the bank and freed my wife from this illegal detention and attempt to kidnap them. Had it not been for the governors intervention and prescence the bank would have been burnt down by the crowd. My family have since left Ekiti state. This is Buhari’s Nigeria and we will resist his wickedness and tyranny. We intend to sue the bank and to sue the EFCC for this illegal and wicked action. They have no right to do this. If they want to see my wife all they need to do is to invite her. We have nothing to fear. They do not need to be so primitive and barbaric to people.